← Market Timing Brief for the SP500 Index Close on 9-20-2013: Testing, Testing. QE Reduction Coming Soon! Please read the prior post on the SP500 and the 10 Year Treasury first and come back to this one. I give the blow by blow on the Fed blabbing last week in that prior post. Gold volatility increases with the Fed “Transparency Program”! GLD must hold that 7-17-2013 low (second red line from the bottom) at the worst or you’ll see spot gold back testing 1200/oz. Gold is very much exposed still to Fed action, so an October QE reduction could cause any profits accrued from the last bottom to be wiped out. Expect a new major low in gold if the Fed acts too quickly to end QE. What does this mean? It means gold is a trade, not a great investment unless you are simply using it as a long term dollar hedge and don’t care if it drops by another 25%, which it easily could. If you have major gains in gold since 2001, you should preserve your entire principle at some point as I have and “ride the profits.” You might then sell a second time to protect 100% profits (sell the principle then once again sell the amount of your entire principle). If you believe the Fed will cause hyperinflation, you should sell nothing at all and be adding to your gold position at every lower low. Make your own judgement and then act on it with a stop loss in case you are wrong. If and when you take money out of gold, it should likely be deployed into real estate (a house) or into stocks (not quite yet though) until the Fed drives interest rates back up above 4-5% over the very long term. I’d consider getting a house now if you know where you want to be or where you want to invest, before rates move back up, and I’d add to stocks on the next pullback and then hold them through the next rally, which will end when the Fed either causes inflation or does too little to support the economy by ending QE too rapidly with interest rates running well above 3%. My Sentiment Survey, Survey Says! report is out on the private page. Be sure to read my private comments on the main site, SunAndStorm.com, by subscribing at no charge below. 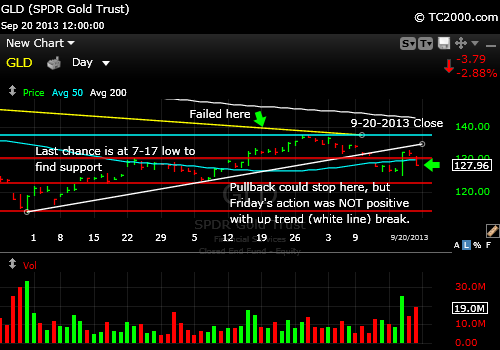 This entry was posted in federal reserve, gold, investment, Treasuries and tagged gld, gld etf, market timing. Bookmark the permalink.